First, we acknowledge that we are located on the traditional unceded territories of the Sḵwx̱wú7mesh (Squamish) people. We are a small beekeeping operation located in Squamish, BC. In our apiaries, the long term health of our bees is the most important to us-not honey production. We believe that the future of beekeeping lies in breeding locally adapted bees over time to rely less on chemical treatments from beekeepers. We employ integrated pest management practices to keep our bees healthy, relying first on non-chemical methods. ​We plant pollinator friendly flowers and provide nesting opportunities to support our native bee and pollinator species, acknowledging that honey bees are not native to North America and can compete with local species for nectar and pollen forage. Pollinator education is very important to us. If people know about how to help our pollinators, we can help them survive. Darwyn and Michalina are two beekeepers who grew up on the West Coast. 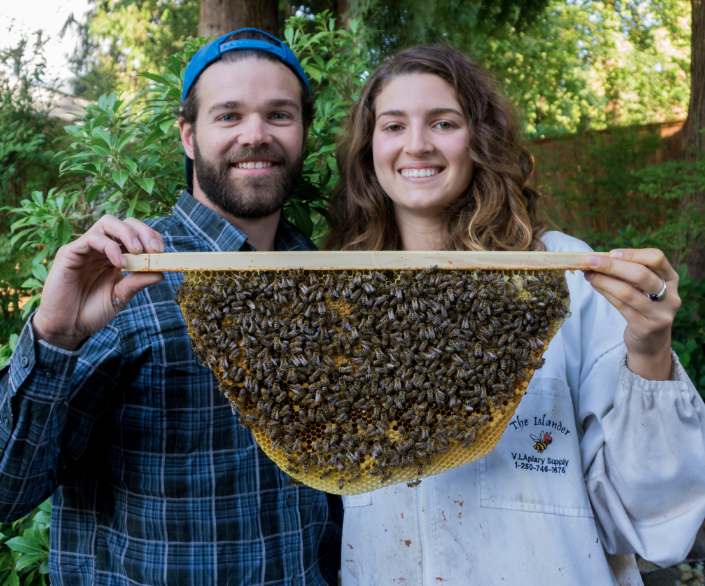 They both moved to Squamish for school, got into beekeeping, and the rest is history! Michalina fell in love with beekeeping in New Zealand helping a beekeeper lift her heavy hive boxes (how many other beekeepers get into beekeeping this way?!). She participated in a honey harvest, and even though she's allergic to both honey and bee stings, got hooked. She started the beekeeping club at Quest University, and worked at the Elle Bee Lab at SFU for a summer learning about wild bees in blueberry pollination. Darwyn got roped into beekeeping when he would help Michalina lift heavy hive boxes at Quest University. He started his own beekeeping adventures when he caught a swarm in a cardboard box one day, and quickly built a top bar hive to house them. Both of us are certified Bee Masters from the Ministry of Agriculture/UBC program. Darwyn is a BCHPA certified introductory beekeeping instructor.